Yahapalanaya or good governance is no new concept. Its origins could be found in our ancient scriptures; its inherent qualities are still shaking the modern concepts of governance to their core and questioning their validity; its singular appeal to fair-play and justice is casting aside all mundane excuses of attempts at alternatives and when suppressed, its wailing had been echoing down the primeval caves to modern day corridors of power, burning for inevitable awakening and eventual rebirth. Man and man alone has stood in between good governance and its unacceptable alternatives in whatever the manner, shape or form it may embark upon his governmental affairs. From the great Caesar to Lenin, Hitler, Stalin and Mao Tse Tung did suffer at the merciful hands of good governance, for they did not teach or practice it. Modern social scientists analyse the various norms of governance and their evolution through the ages in terms of the measures of the various prisms (or prisons) of their education and learning. And in these analyses, they lose the obvious and get caught up in a conundrum of pros and cons, hypothetical theories. Instead of using their education as an elementary tool for analysis, they try to fit their answers and solutions to fit into their pre-cast theories. What is good governance? The writer’s answer is: it’s ‘dispensing greatest good for the greatest numbers within a reasonable amount of time and costs of resources’. 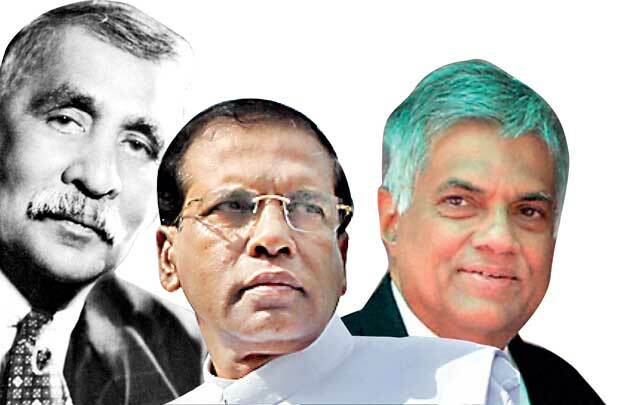 In terms of that definition of good governance, every government, may be barring the first administration since Independence of D. S. Senanayake’s, has failed in this aspect. As I have written earlier, one cannot expect a perfect union between the people and government. That kind of utopian vistas are far too delusionary and would amount to loitering about in a fantasy land. But the opposition to a government that used good governance as a critical form of governance as against a regime that for all means and ends looked, acted and consummated the ugly craft of hoodwinking the masses at a phenomenal degree, deserves more clarity and forthrightness. Those who are opposed to the current government led by Maithripala Sirisena and Ranil Wickremesinghe are doing so in order to safeguard themselves from the very tools of good governance that are being aimed at them. Those tools, the judiciary, legitimate and legal commissions and other state-sponsored institutions have exposed the corruption, nepotism and plain ‘bad governance’ of the last regime. Those who seem to be in a mighty big hurry to finish these inquiries and investigations may have a legitimate case against the pace at which they are being pursued, but once again, they, the critics, need to be reminded that good governance requires that before any verdict or judgement is passed against those who are being charged with these unholy acts of bad governance,too need to be given a fair hearing. If that is not good governance, then what is? It’s quite easy to stay in the cushy and comfortable drawing rooms in Colombo 7 and loiter around the corridors of social clubs or five star hotels, drinking the most expensive whiskies and cognacs, helping themselves to the unpronounceable French cuisine and pass judgements on the pace and degrees of government-sponsored investigations and probes. These very guys and girls who were ominously silent during the last regime; their deathly silence in face of many atrocities and corrupt practices of the said regime that really endangered the socio-cultural fabric of our nation, in fact, vicariously contributed to the sustenance of an incredible pattern of state-craft practised by the Rajapaksas. Those who kept silent during the last regime have abdicated their right to criticize the pace at which the current probes into the Rajapaksas and their horrendous pastime of poor governance and destruction of age-old values that kept this nation going forward. If they had any arguments about the substance or constituent ingredients of the charges that have been levelled against the perpetrators, then that’s a different issue altogether. But these scavenging business tycoons who make every attempt to make a fast buck when the going is good and then sit in judgement on those who try to right the wrongs of the last government and its wheel-turners is abominable, to say the least. While the writer most emphatically denounces any attempts of sabotage or mishandling of the so-called investigations and inquiries by any state-employed officer, he would not retract one single word of criticism of these born-again critics whose only ostensible reason for their critiques are based purely on self-centred money-making. It is a universally proven fact that acceleration of development could be achieved via non-democratic means. Most dictatorships have made stupendous advancements in increasing Gross Domestic Product (GDP); they have attained material gains in relatively short timelines. But at what cost? This million-dollar question keeps bursting up each and every time a democracy replaces a dictatorship. And the answer is not too easy to discover. The passage of the Nineteenth Amendment (19th A) and its restrictions on the term of Presidency alone is a valid and legitimate reason for any reasonable Sri Lankan to rejoice about. It spelt that the last President is no longer eligible to run for that office. However, he still could run for the position of Prime Minister and in the context of diluted powers in Presidency, the Rajapaksas cannot be ruled out of dreaming of coming back to power to continue their hegemony in the country’s politics. In a scenario where the defeated powers are still wielding some kind of real power -- by way of a vociferous clique of fellow travellers -- containing them is rather difficult, if not impossible. An astute leadership at the government level, without falling into a trap of being reactive instead of proactive on multiple fronts. The absence of an effective media thrust is greatly felt. Without being propagandistic, the present Government can easily launch a dynamic, credible and tasteful media operation to garner the support of the public. The international goodwill that has accrued to President Sirisena and Premier Wickremesinghe, especially on the Government’s approach to the Tamil Question and the visible impact it has made in the minds of the Tamil population in general is universal. This was clear to the writer who undertook an extensive trip in the Jaffna peninsula during the last two weeks. The aura of freedom from fear and inexpressibly intense feelings and hopes for a better future, their thirst for education, the thrifty lifestyle quite in contrast to the Colombo and other urban based communities in Sri Lanka are noticeable. If only the rest of the country’s emerging middle class would take a lesson from these folks who live in the parched land of the North, management of the country’s economy would be much easier. The Sinhalese chauvinists and other fringe groups might not accept it, but what should be told must be told. Education and its value and validity in a rapidly developing world are essential ingredients if one is to make a prosperous and happy life. While I do not take anything away from those who reside in other parts of Sri Lanka and their dedication to providing a quality education to their children, the value system has changed immensely and the very manner in which emphasis on extra-curricular activities in schools is any indication, the absence of any comprehension of the inner core of scientific advancement is evident. The suffering and trauma of the last thirty plus years, the humiliation and discriminatory treatment at the hands of the ‘other’ race, the Sinhalese, eviction from their ancestral lands for military and other government uses, lack of opportunity at state-employment avenues, all these have contributed tremendously to a sustained mistrust between the communities at every level, whether, leadership or grassroots, official or personal and business or professional. Relationships at personal levels that some members of both communities enjoy cannot be construed to be a signal of normalization of relationships; the Tamils argue and quite rightly so, that institutional discrimination that has been practised by government and private establishments is a no-no. The Sinhalese majority simply cannot deny that and it is to their long-term disadvantage to do so. Economists and social scientists would agree that a divided nation- that of the Sri Lankan nation -- is much more susceptible to the vagaries of global storms and economic downturns than a united one. Then what is the answer? Most pundits would say that education is the only answer. But taken in another context, Robert Gabriel Mugabe, the current Zimbabwean President , serving since December 22, 1987 earned numerous degrees-courses while detained, including three from the University of London: degrees in Law and Economics respectively and a Bachelor of Administration, but as the leader of Zimbabwe, his conduct was most atrocious and inhumane. If such an educated man could conduct State affairs so viciously and savagely, what could the not-so-educated public do? A silent public is the most responsible for the emergence of extra-democratic rule. In such a confusing scenario, Sri Lanka, as a whole and a collective mindset, needs to respond to this age-old problem of the Tamil Question with a decisiveness which has been absent all these years. Our political leaders alone cannot do that and our recent past has proved it. A coherent message needs to go down and who will render it, I don’t know.